The fight in the mobile phone universe is now shifting midstream, after five years of flagship brawl running unabated. All players are suffering from a flagship fatigue and market saturation at the high-end, so they are reshifting positions for the exploding Android midrange opportunity. What are the current midrangers offering, though, and are they worthy of the nascent landgrab that is about to ensue in the category? Good midrangers these days start you off with a 720p display, which means we'll have both H1 2013 entrants, and last year's flagships in the slideshow below. We are rounding up a few of the best representatives of the upper midrange echelon that typically go for less than half a grand without contract subsidies, to help you choose in the $300-$500 SIM-free price range. Great design for the slimmest smartphone out there? Check. Pentaband radio for the globetrotter in you? Check. Mediocre camera? Check. For the ~$400 price and the looks of the Ascend P6 we are willing to overlook the finicky camera quality as the P6 is a great Android device in the rest of the departments. It might not have the Full HD screen of the flagship Z sibling but the Xperia ZR offers plenty of oomph for its sub-$500 price. It is waterproof, just like the Z, and you can shoot 1080p movies underwater with the dedicated mode of the 13 MP Exmor RS camera, something that no other watertight phone can brag with. A slew of candy colors rounds up the pretty offering. HTC just took the wraps off the mini version of the HTC One, and it sports the same awesome BoomSound speakers at the front in a more compact and manageable body aluminum unibody, with the same great screen tech of its larger brother. It's the Nexus 4 that made Google Experience phones proliferate, as it stuffed modernity inside a glass chassis for a rock bottom price. If you want to get the latest Android versions first at a grand total that will make you smile, this 720p handset is for you. The Optimus F7 is actually giving the Nexus 4 a run for its money with its $300 price tag and similar specs; it has the new Optimus UI on, though, rather than stock Android. 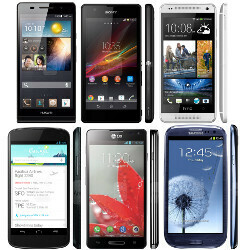 At this price it is one of the most affordable and well-rounded 720p Android phones. Last year's Samsung flagship broke all sales records, and if you are into the eye-popping colors of AMOLED displays and good resale value, the price is now just right to get this thin and light Android. The HTC One X+ came to right all wrongs with the One X, and brought on the same awesome bright display, but upped the ante with a faster processor and the most internal memory of them all at 64 GB. Couple those with HTC's svelte unibody design, and the current price might just be in your ballpark already. Xperia zr having flagship specifications And taken under mid range segment??? How?? The title says: "best Android phones with HD 720p displays" Xperia Z is their flagship Did you read the whole article before commenting? ZR doesn't have a 1080p screen. It is priced almost equal to S3 here in India. He said : "Xperia Zr having flagship specifications And taken under mid range segment??? How??" He means that Xperia ZR have flagship specifications, why it's taken under the mid range segment? Did you read his comment before replying? Qualcomm S4 Pro + 720p + Android 4.1 (so far). Sorry, but those add up to be a mid-range phone by most of today's standards, and if they don't they certainly will pretty soon when the S800s and Tegra 4s start coming out. Don't worry, mid-range phones are looking MUCH more appealing than mid-range phones of yesteryear. I'm still perfectly content with my Evo 4G LTE despite it fitting firmly into the mid-range category now. look bro 720p DISPLAY qualcomm snapdragon s4 pro want to know high end? 1080p DISPLAY qualcomm snapdragon 600 or even 800 GOT IT? Lol Xperia Zhave more superior specs. Try to research b4 posting crap. Actually it's still their current flagship until a newer model comes out. Regardless of it being released last year, it's Google's newest and still packs a tremendous punch. Being a current flagship has no bearing on whether it's high-end or mid-range. It still packs a punch, but so do pretty much all flagships from 2012. LMAO! So using your logic the Palm Pre is still a flagship. Rocking a GS3 I9300 running LiquidSmooth 2.8 based on 4.2.2. Feels significantly faster than any GS4 I've seen. I think Xperia SP is also better than HTC One Mini and has better value for money. all mini's is a flop s3,s4 and one. they just overpriced. I disagree that the nexus 4 is a mid-range phone just because it does not have 1080p HD! it still has 2gb of ram still a very fast quad core processor plus will get the latest and greatest of android first! Ascend P6 definitely takes his, premium build, very slim build, good battery life, easy UI and superb screen. Um... If not a mid-range device, then what is it?